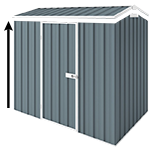 Great value slim line zinc garden shed. Comes with flat roof and only 0.75m deep so it easily fits into narrow places. Double hinged doors provide easy access on the 3m side. Great value slim line zinc garden shed. Comes with flat roof and only 0.78m deep so it easily fits into narrow places. Double hinged doors provide easy access on the 3m side. 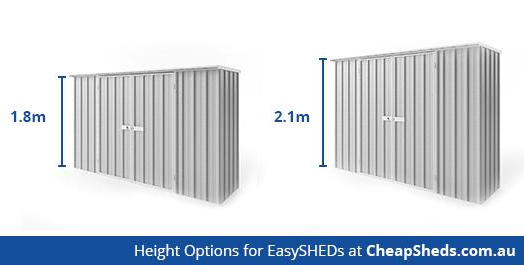 Check out the wide range of accessories below that you can purchase with this shed. NOTE: The image is for illustration purposes only. Product arrived well packaged with easily to understood step by step instructions. I followed these to the letter and was able to assemble an install the shed to my chosen location without assistance. The shed is now painted to match our new fence colour Meadow, blends in very well, occupying a space which was deemed to be unusable due to the narrow aspect. We have fitted the shed out with shelving.